I was looking for something simple and quick to bake, something which didn't require me going to the store. I found exactly what I was looking for in "Rose's Heavenly Cakes" by Rose Levy Beranbaum, which I just borrowed from the library. This is a great and gorgeous book with endless pages of recipes. The book will definitely go on my Christmas wishlist. I decided to make Gâteau Breton tartelettes, which is a very buttery cake from the French region Brittany (Bretagne). It is flavored with rum and vanilla and has a beautiful golden color. 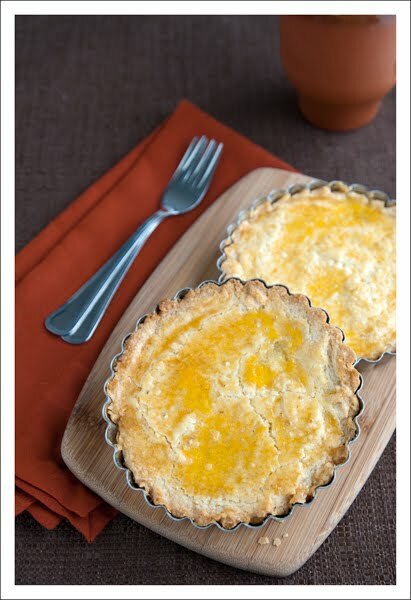 The tartelettes go perfectly with a good cup of tea in the afternoon and will melt in your mouth. Preheat the oven to 325 degrees Fahrenheit (170° Celsius). Grease your tartelette forms with butter. Slowly toast the almonds in a pan without fat on low heat. Be careful not to burn them. In a bowl whisk the butter and sugar together with a mixer, until smooth. Beat in the egg yolks, one at a time. Add the almonds, salt, rum and vanilla, while continuing mixing. Slowly add the flour in a few steps and mix it until the dough comes together. Put the dough into the tartelette forms and smooth out the top. Brush the tops with the egg, until coated. (You won't need the whole egg.) With the prongs of a fork you can "slice" a pattern on top of the cakes. Bake for about 30 minutes, until golden brown. Let cool on a wire rack. They will keep for a couple of days in an airtight container.